NEW DELHI — The U.S. and India signed a critical defense information sharing agreement Wednesday that will allow each country greater access to each others' communications networks, but could not come to an agreement on India’s planned purchase of Russia’s S-400 air defense system. Mattis and Minister of Defense Nirmala Sitharaman signed the Communications Compatibility and Security Agreement, or COMCASA, which in practical terms will improve information network access and sharing so that in future weapons acquisition, secure communications links common in U.S. weapons systems, such as Link 16 in U.S. jets, can be included. Until now, those tactical communications capabilities have not been included in India’s major weapons purchases. The two sides also agreed to enhanced defense cooperation, to include joint exercises on India’s coast in 2019 and the establishment of a hotline between the U.S. and India. 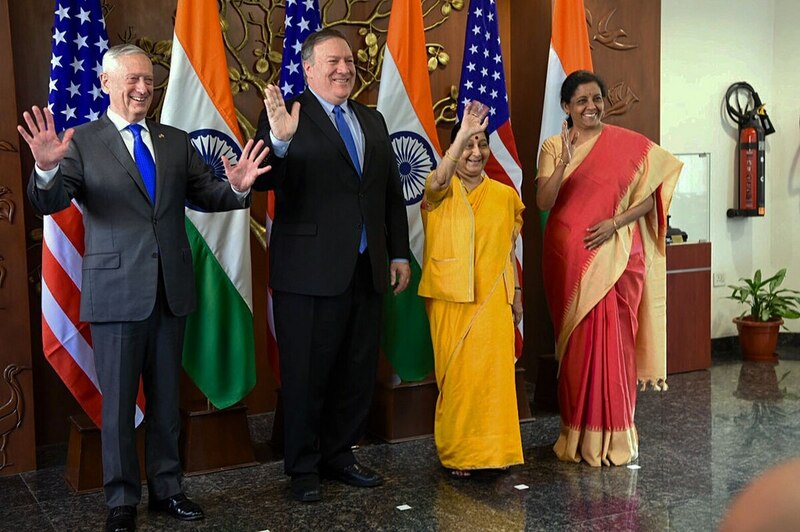 Mattis and Sitharaman then joined Secretary of State Mike Pompeo and India’s minister of foreign affairs Sushma Swaraj to address Indian and U.S. media. The defense and diplomatic leaders said the agreements were the latest sign of a strengthened U.S.-India relationship, recently underscored through the U.S. renaming Pacific Command to Indo-Pacific Command. But the two sides did not come to a resolution on one of the higher-visibility issues between the two sides, India’s planned purchase of five S-400 systems, in a deal worth an estimated $6 billion. “There’s been no decision made,” Pompeo told reporters Wednesday after the agreement was signed. But Pompeo seemed to suggest a waiver is possible. COMCASA is one of four “foundational” agreements that intend to increase interoperability between the two militaries. It follows India’s signing of the Logistics Exchange Memorandum of Agreement in 2016 with former Defense Secretary Ash Carter. That agreement set terms for greater logistics support during port calls and exercises.